Your Church pack can be used on Remembrance Day or at any other time in the year, if your church is recalling the lives and faith of local people during World War One. It includes a service plan and a short sermon, suggested hymns and readings and ways to visually represent the scale of loss. The short video is a dramatic presentation of Revelation 21. 1-7, the verses that are often read on Remembrance Sunday. Why not use this video in your Remembrance Sunday event? The long video gives a sense of the place of the Bible in the lives of those who lived and died during World War One. You could use it during a Remembrance Sunday event, show it in your home or prayer group, or simply share with friends. World War One was a tragedy that affected millions of people from all walks of life. 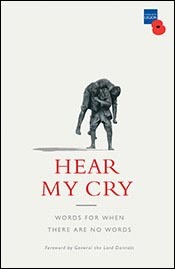 As your church or house group reflects on the centenary of the war, Hear My Cry provides a great resource for reflection, with individuals’ stories, readings and Psalms. Family members of those who lived and died during World War One talk movingly about their ancestor’s wartime experience and their faith. This is a great resource for churches and house groups alike. While in the trenches at the Front, surrounded by mud and horror, former academic-turned-soldier Gerald Warre Cornish began his own translation of St Paul’s letters. He was killed in battle in 1916. But his work survives him. Here you can download his incomplete translation, taken from the mud-spattered copybook that he kept with him.